It may have been only April, but it was a lovely, warm evening for a stroll through SE23. It was also the first real opportunity to celebrate the refusal of planning permission for the Tyson Road development. We started with a small crew at the Railway Telegraph, recently taken over by the new landlady, Pam, who kindly brought over a large plate of hot dogs to help line our collective stomachs. The Telegraph is a fine, large, old pub serving Kentish Shepherd’s Neame beers. We wish Pam the best of luck and hope that members will try it out – maybe even the poker table! More people joined us at our next pub, the hidden back street gem, the General Napier, on Bovill Road. On the walk over, we passed the Stanstead Road Community Garden – immaculately tended - and an assortment of interesting, small businesses including one that makes large models for the performing arts. The Napier just seems to get better and better – on first viewing you may find it a little old fashioned but then it simply grows on you. And it is not featured in any pub guide or blogs on the area. Maybe it is best kept as our secret. Onto the refurbished Tapastry for the grand reopening, no less, now that the owner, Jason, has expanded into the old video shop next door. But the name has truncated to ‘Try’. 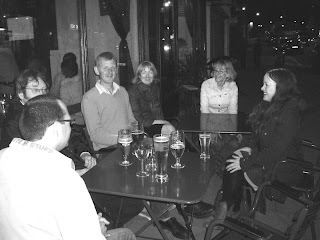 It was buzzing, so much so that we sat outside in the still mild evening. There were new beers to try from the Meantime brewery in Greenwich (a note for your diary is the Greenwich Beer and Jazz fest on 8-12 July at the old Royal Navy College, where the brewery will soon be located.) Our agenda would have had us crossing the border into Crofton Park to check out the refurbished Brockley Jack and onto a fave, Mr Lawrence’s Wine bar, but we couldn’t face leaving Honor Oak so left these exciting venues for another crawl.